Are you a watcher or a player? 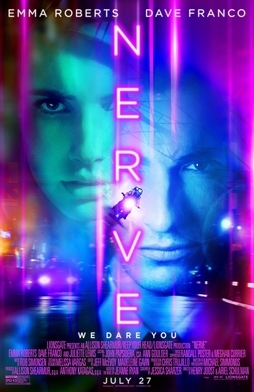 That’s the question that lies at the premise of this summer’s hip and unique thriller Nerve. In this 2016 film starring Emma Roberts and Dave Franco, an online game has been created in which players win money by performing increasingly dangerous tasks out in public, and those prizes are funded by people who pay to watch them accept dares that range from the embarrassing to the potentially deadly. Emma Roberts plays Vee, a socially-awkward overachiever who is anxiously contemplating her future as her high school life draws to a close. Tired of living in the shadow of her popular friend Sydney (Emily Meade), she steps outside of her self-constructed cocoon and joins Nerve as a player. The stakes start out relatively low as Vee’s first dare is to kiss a stranger for five seconds, and that’s how she meets the dashing and mysterious Ian (Dave Franco), who she quickly finds out is another player who may have a hidden agenda. Their meeting turns out to be uproariously popular among watchers and they team up for a series of dangerous missions throughout New York City. Nerve harbors an inventive concept for a movie, and quite loudly serves as a social commentary on Internet addiction, on the mob mentality and abject desensitization to which the online sphere has given birth, and on the way we all measure our own worth on something as silly as social media recognition. The game itself is frightening when its depth is exposed, as its hosting across countless Internet servers makes it seemingly impossible to shut down, even when it culminates in watchers voting on the assassination of one of the finalists. The film is fast-paced once the action gets going, and the flashy cinematography and on-screen graphics at points give it a nauseatingly modern feel. Roberts is more than competent in her role, and although she’s the daughter of Eric and niece of Julia, previous accusations of Hollywood nepotism that have been slung at the family are null and void here, because Emma is no slouch in front of the camera. Dave Franco, with his ever-present mischievous grin, is mostly playing himself here, but that’s all well and good since he’s nowhere near as odd as his brother James. The film’s climax is gut-wrenching, but ends up being predictably happy. This is somewhat disappointing, as a negative ending is more fitting when such a horrifyingly heartless world is created for a film such as this. Overall, Nerve is slick and at times keeps you at the edge of your seat, but it may have benefited from a more nihilistic denouement. However, it’s still worth the ride, especially if you need a break from this summer’s superhero slugfest.